Welcome to the Fairy Hop hosted by Gill of Creations By Gill. If you arrived from Haidee’s Blog the you are in the right place. If you just happened to be here, then be sure to head over to Gill’s blog and start at the beginning. Today’s blog hop theme is all about Fairies. Be sure to visit each blog as several of them have special or secret letters that comprise a special message. Then be sure to head back to Gill’s blog for details on how you can win some great prizes. Plus there is some great blog candy along the way. So here are my two projects. 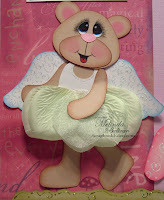 This layout features a cute little paper pieced Fairy Beary Sweet Bear. Here is a layout I created with my version of a Tinker-Beary Fairy. Here is a close up of the “Tinker-Beary” Fairy. I made this layout as a page kit. If you’re interested in the page kit, it is on sale at PaperCraftingWorld.com. You can get the direct link HERE. Your next and last stop is Janice. Be sure to hop over and then head back to Gill’s. and I don't blog alot! oh and I don't Like bears!! Both LO's are awesomely beautiful.